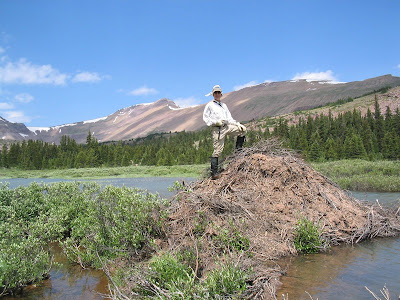 A beaver lodge, apparently abandoned. Gilbert Basin, High Uinta Wilderness Area, Utah. To view beautiful skies from all over the world, click here. If we had a olfactometer, we would see that the olfactory nerves of our animals are often officially in over-drive. Their sense of smell can lead to high-octane observation, and obstreperous, offensive, even odious, behavior. For instance, on the occasion of an offered oral and odiferous delight, Daisy may obliterate all interference and become oafish and obdurate, or overly optimistic, jumping for the object as if competing for Olympic gold. She will go for an olive or an omelet, being a creature of omniverous taste. Or she may decide obedience will cause her human to offer the object of delight, though her occult eyes may give her away. Or sometimes cuteness is her ploy. Horses prefer oats, fruit, or orchard grass. And like Oliver Twist, their pleading optic orbs and twitching olfactory nerves seem to say, "Please, sir, I want some more." With their obsessive interest in ordinary odors and associated foods, it is odd that these creatures do not become obese. For more O words from Denise Nesbitt's ABC Wednesday, click here. 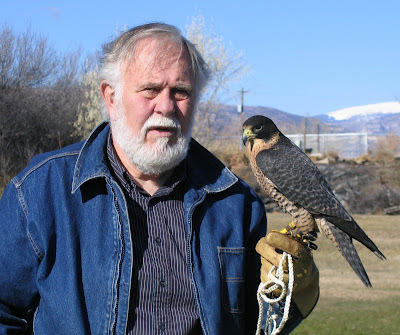 During a falconry meeting in Vernal a few years ago, we happened upon a fellow from Michigan who had lost his young peregrine falcon during a training exercise. We put him in touch with a friend who does raptor rehab, and together they located the falcon -- sitting on the roof of the local Walmart, of all places! Here's Stan with his recovered bird. Later, we went to see a display of all the birds. I thought this Gyrfalcon was particularly beautiful. 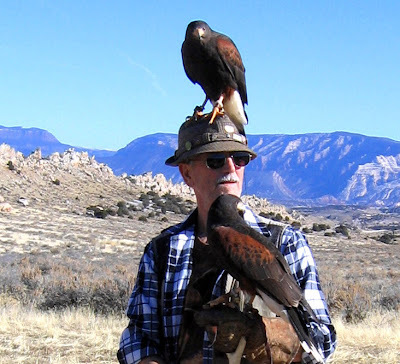 We talked to some falconers who were looking for a good place to take their birds and hunt rabbits. Since we've covered a lot of local territory, we offered to lead them to a bunny-rich area and go hawking with them. 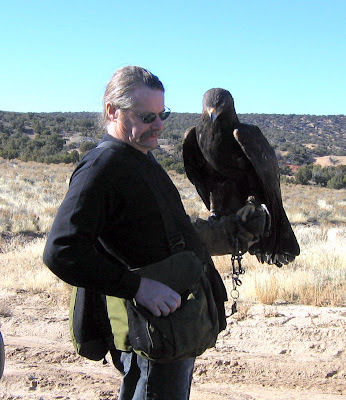 Here's Peter with his golden eagle. Eagles prefer jackrabbits. We scared one up and watched the golden hunt. 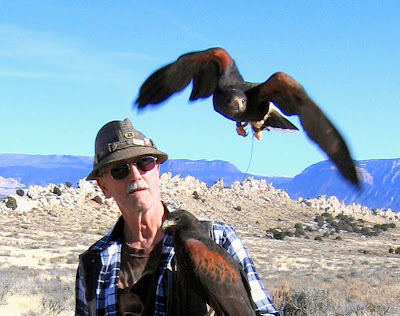 Here's Lee with his pair of Harris hawks, Tweety and Sylvester. The birds work as a team. They caught several bunnies. I felt a little sorry for the prey, but it was fascinating to watch the birds hunt. To see a variety of worlds, click here. See what a faithful friend I am? I'm guarding while Boss takes his nap. Hmm, this guarding job is a lot of work. I'm feeling a little sleepy. Boss won't mind if I lie down for awhile. See? I'm yawning. I can't help myself. I need a nap, too. There's still a lot of snow at 9000 feet, as we found on our Lake Mountain ride this week. The white mound in the background is Marsh Peak, 12,200 feet, part of the Uinta Mountain chain. We'll take this ride again in a month. By then, there should be green grass, flowers, and leaves on the aspens. For more skies from around the world, click here. N is for Native American. This man is Navaho and lives in New Mexico, but in summer he herds sheep in the Utah Uinta Mountains for a rancher from Nevada. Note his nimble, noble steed, the color of a gold nugget. He lives the life of a nomad, with the natural world for a neighbor, and nebula or nova for nightlights. He resides in a trailer with the bare necessities. His two border collies help him nurture the sheep and nudge away their nemesis, the coyote. Neither here nor there news: We met this Navaho gentleman last July in the mountains north of Strawberry Reservoir. He asked if he could take our photograph with his disposable camera. We agreed, and asked to take his photo in exchange. Do you see the black sheep behind him? We helped herd the sheep up a nearby mountain, then bid our new friend adieu. 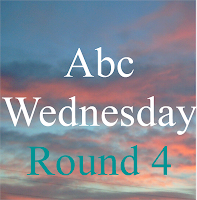 For more N words from Denise Nesbitt's ABC Wednesday, click here. Tabby Mountain Wildlife Management Area always provides an excellent ride. The gates are closed to vehicular traffic until May, but the horse gate is always open. The temperature was in the sixties at the trailhead, 6800 feet. Wildlife was out in force. The horses had a refreshing drink at a mountain spring. Snow covered the trail at 8300 feet. By traveling off trail in sunnier areas, we were able to reach an 8800 foot ridgetop for amazing views. Our GPS profile shows we traveled 18 miles with 3100 feet elevation gain and loss in 4.5 hrs. Back at the trailer, Daisy enjoyed a well-deserved rest in the shade. For pictures from fascinating worlds around the globe, click here. On a recent ride in the Cedars, we found that the beavers have been hard at work fixing a little hole we made in the dam to see whether it was active. The beavers made a nice repair. Looking around, we found a few recent sapling cuts. You can see the teeth marks in this one. We saw these tracks alongside a dry dirt road not too far from a reservoir. They were about 4 inches long and continued for a hundred feet or more. What made them? Our best guess is a sandhill crane. Any other ideas? Daisy enjoyed a swim in a large pond. Indian rice grass is greening near the roots, with the grain still remaining from last fall. This is Mischief's favorite snack. Boss likes it, too. A storm was brewing over the mountains as we rode back to the trailer. The mountains have 100% of normal snowfall for the second year in a row. All my free time lately has been taken up with an ongoing irrigation project. Irrigation makes the difference between dryland sage and pasture grass around here. We had gated flood irrigation in previous years, but the new pressurized sprinkler system is supposed to be more efficient. Here's the pump house site, which so far only has a foundation and a big pile of dirt around it. We were supposed to be finished and ready to go in a week, but due to parts arriving late, we're now in week three. My fingers are crossed that the work will be done soon. Very soon. At least the grass that hasn't been dug up looks green, and the sky is always pretty. M is for Mischief in a meadow, at one with Mother Earth, the mountains and the music of the meadow lark’s melody. Mischief munches a meal without mishap as a marsh mirrors the midday minute or the moonglow at midnight. Moss on the moist stream banks, minnows in the meanders, mosquitoes in the morning, all mingle in mutual accord in the midst of this mountain mien. No monetary value resides here, but a mental mellowness murmurs peace in a mysterious, merciful meeting with nature. What’s that movement in the marsh? A moose? A mermaid? (Actually, an elk.) No matter. All melds into myriad memories, a metaphor for the land of milk and honey. In this manner, my M mission is managed. Mischief in a May meadow. For M words, magical, mysterious, or mutinous, go to Mrs. Nesbitt's ABC Wednesday here. On Friday, we trailered the horses south of Ouray, Utah (named after a Ute leader of the late 1800’s, now part of the Uintah & Ouray Reservation), and across the Green River to Willow Creek. This area is all BLM land, with a lot of oil and gas wells and a few active pumping units. 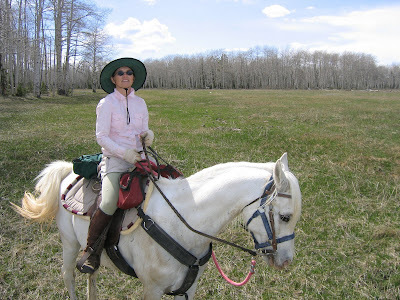 We parked next to a bubbling spring that adjoins a small pond, saddled up, and headed out across a dry desert landscape. The roads were sandy and allowed for easy cantering for miles at a time. In the first hour, we covered 10 miles. After that, not only Daisy, but even the horses were ready to cool off by eating snow. Our destination was Big Pack Mountain, at 6600 feet. At this time of year, we can’t go much higher without reaching a prohibitive amount of snow on the trails, so desert rides like this one are our best, and warmest, option. This trio reached the top first. From the high point, the view was of vast, wide open spaces, one of Utah’s greatest features. On the way back, we had views of the High Uintas, our summer riding heaven. Clocking in at 21 miles, 1600 feet elevation gain, in about 3.5 hours, this was our most ambitious ride so far this season. For visions of more worlds, click here. A Monster - Look Out!